1799, Virginia land transfer, signed by numerous men of fame, Morgantown, Virginia. 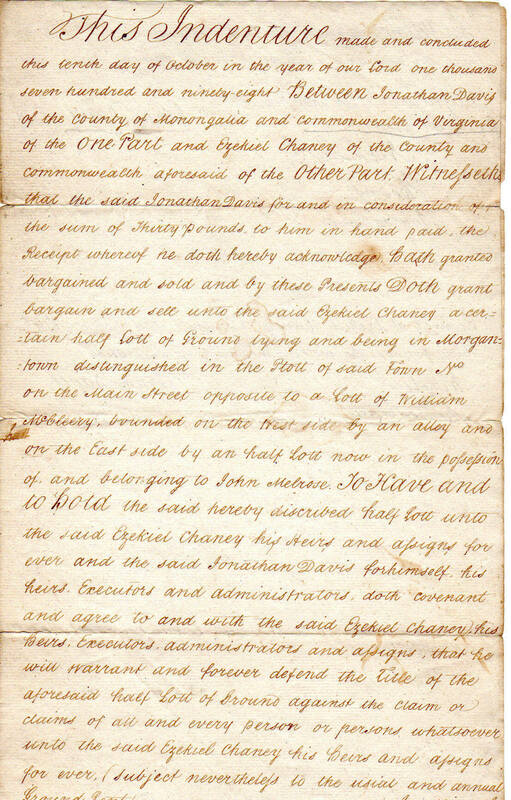 This is a wonderful, original document, dated 1799, Morgantown, Virginia, where Jonathan Davis has purchased a plot of land from Ezekiel Chaney....signed on back by Jonathan Davis, Noah Linsly, John Evans and Nimrod Evans. 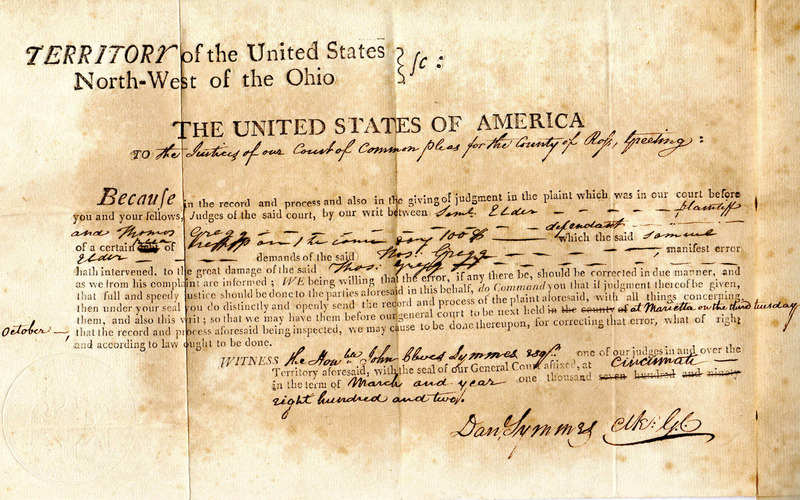 Document is 8x14, folds, slight tenderness along fold lines, minor outer margin faults, else a scarce document from the newly formed Morgantown. Establishment of the Linsly Institute.—The establishment of this institution at Wheeling dates back to the year 1814. Its founder was Noah Linsly, who was born in Bradford, Connecticut, in 1772. He was a graduate of Yale College and in 1798, came to Morgantown, then in Virginia, where he spent two years and then removed to Wheeling, where he died of hemorrhage of the lungs in 1814. In his will he made provision for the establishment of a school, to be free to such white children as the trustees might deem worthy. Samuel Sprigg and Noah Zane were named as executors of the will and they hastened to apply to the Virginia Assembly for a charter for the school. This was granted and the school put in operation. It still continues its usefulness. John Evans (Colonel) Born Fairfax County, Virginia, Dec 9, 1737 and resided in Louden Co. until age of 12 when his family moved to Monongalia Co. 1769-1770 and died there May 1, 1824. His grave is in the Oak Grove Cemetery, Morgantown, West Virginia. He served in Dunmore's War in 1774 as a Lieutenant. He enlisted in the Revolutionary Army in April or May of 1778 and served as a Colonel until Dec. 29, 1778 under Generals McIntosh and Washington in command of militia from South Branch and Ohio Valley. Built Forts at Beaver Creek and Tuscarawas and was County Lieutenant (County Clerk) for Monongalia County for many years. Nimrod Evans (son of John Evans and Rebecca Ann Martin) was born January 13, 1770 in Monongalia County (W) Virginia and died February 27, 1828 in Monongalia County (W) Virginia. He married Eliza French Strother on December 29, 1801. 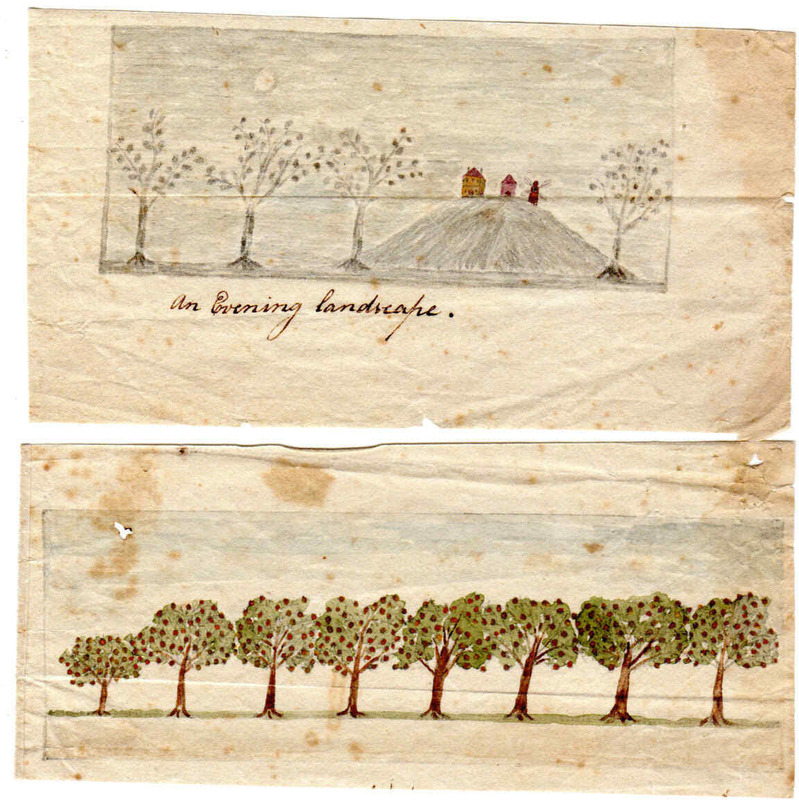 This is a wonderful, original pair of authentic watercolors done by Oliver Ellsworth Jr., during a European trip with his father Oliver Ellsworth, 1799-1800. Watercolors are approximately 3x6, in overall very good condition. As United States Envoy Extraordinary to the Court of France, Oliver Ellsworth led a delegation there between 1799 and 1800 in order to settle differences with Napoleon's government regarding restrictions on U.S. shipping that might otherwise have led to military conflict between the two nations. Ellsworth and his son came down with a severe illness resulting from their travel across the Atlantic (causing him to tender his resignation from the Supreme Court while still in Europe in 1800). 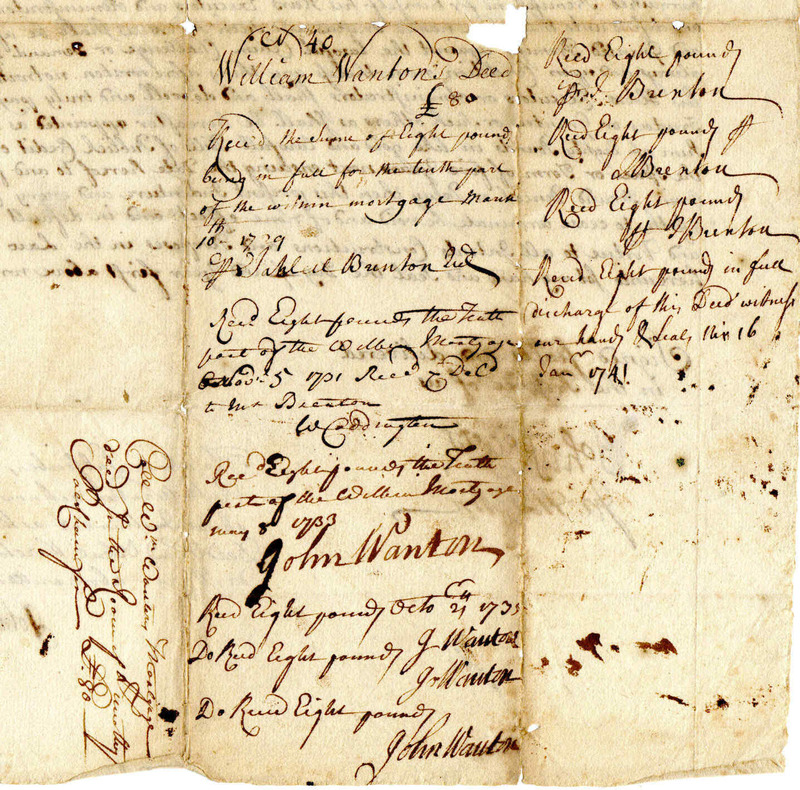 This is a wonderful, original document dated 1756, Pomfret, Connecticut, where the powers that be have placed three year old French Girl, Mary Dansett, in the apprenticeship of Jonas Frost and his wife, where she is to learn the mastery of housewifery. Term is until she shall reach the age of eighteen, at which point she shall be given two good suits of clothing according to an apprentice of her degree. Document is 10x14, folds, minor edge flaws, else in overall fine shape. Signed by Jonas Frost, Nathan Frink and Nathaniel Southworth. Captain Nathan Frink, a Loyalist and confirmed traitor was a native of Pomfret, Conn. He became a captain in the King’s Loyal American Dragoons, and was afterwards aide-de-camp to General Benedict Arnold. Capt. Frink was educated for the bar. His wife, Hester Cuyler, was a descendant of one of the old families of New York who worshipped at Trinity church. He was a grantee of St. John, from which place he came to Campobello, thence removing to St. Andrews, and afterwards to St. Stephen. 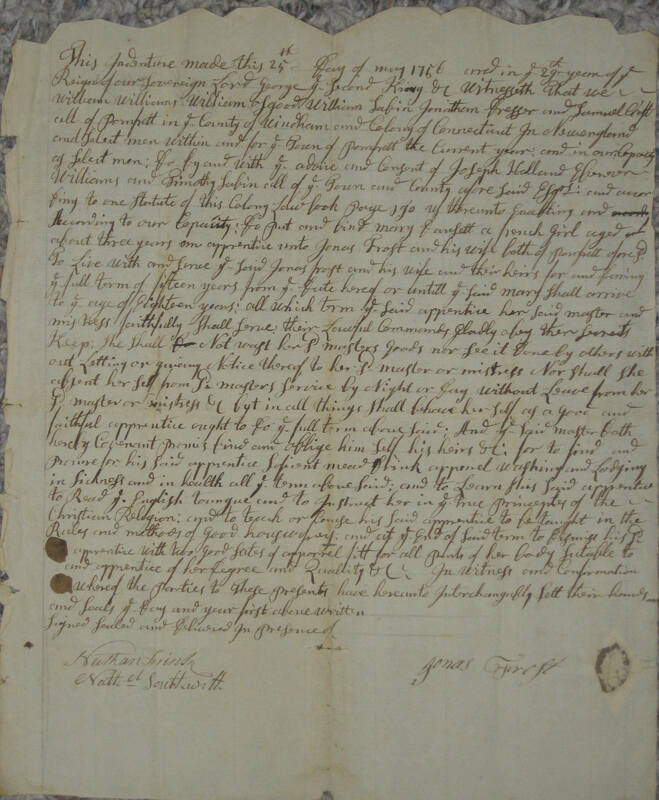 This is a wonderful, original letter, dated 1727, being a double sided communication between William Pepperell and Captain Wadding regarding an earlier communication. 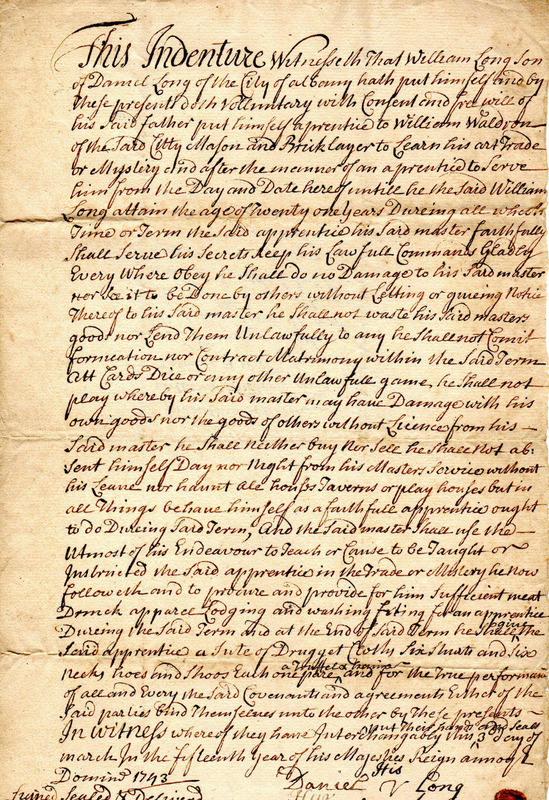 The first side is dated Deecember 3, 1726 in which Pepperell requests payment and hopes that a shipment from the West Indies, long with payment will furnished by Captain Eastwick. 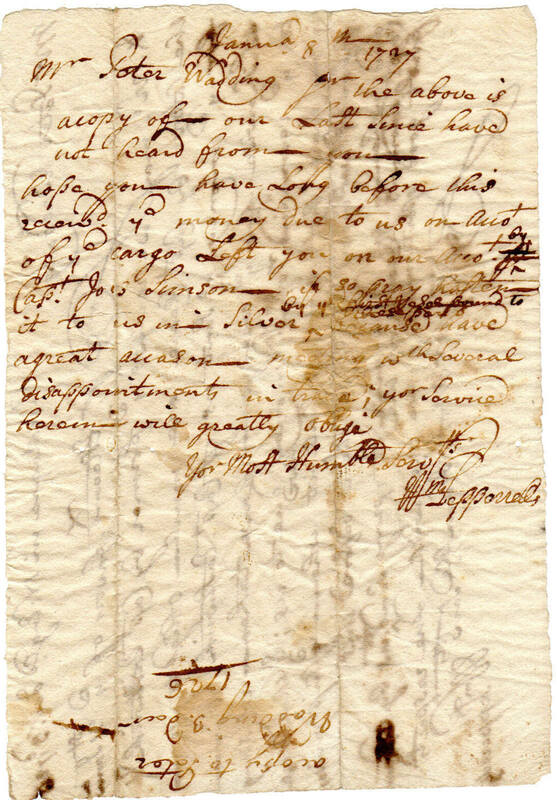 The other side, dated a month later in January of 1727 refers to the prior communication and that payment is truly needed, as there have been many disapointments in trade. 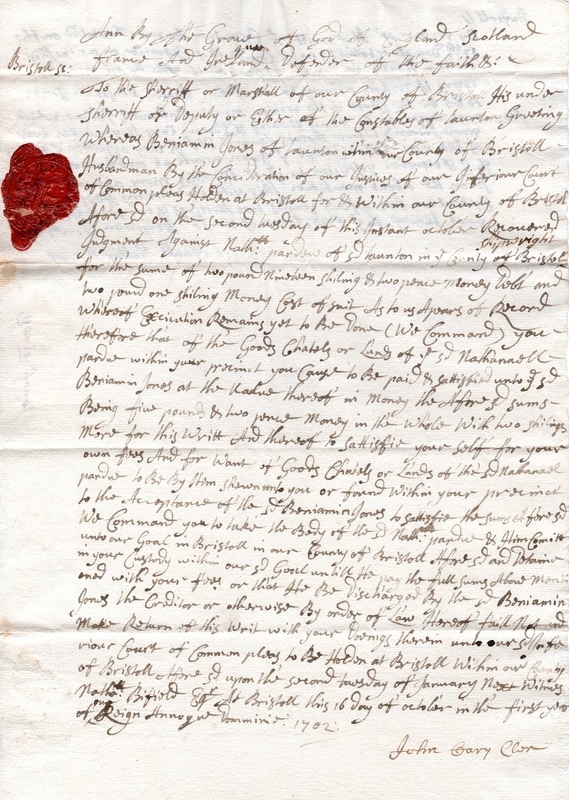 Document is 6x8, each side written and signed by Sir William Pepperell. Minor ink fade in a few sections, else in overall very good condition. This is a wonderful, orginal document dated 1743, Albany, New York, where William Long has voluntarily bound himself as apprentice to William Waldron, bricklayer, to learn the trade. He shall learn the trade and keep all the secrets of his master....signed at bottom by Daniel Long, Ruth Long, William Long, Marte Beekman and John Beekman. Document is 8x12, folds, else in overall fine condition. Marte Beekman was born in September 1695. He was the second son of Albany blacksmith Johannes Beekman and his second wife the former Eva Vinhagen. Their first ward household was large and the home of many Beekman children from two marriages. He married Albany native Geertruy Visscher in December 1721. By 1734, their five children had been baptized at the Albany Dutch church where he was a member and frequent baptism sponsor. Martin Beekman was a blacksmith. He lived in a "good house" in the third ward and owned other property in the city of Albany as well. In 1715, he was a member of the Albany militia troop and later a contractor of the city. By the 1760s, he also was identified as a merchant. 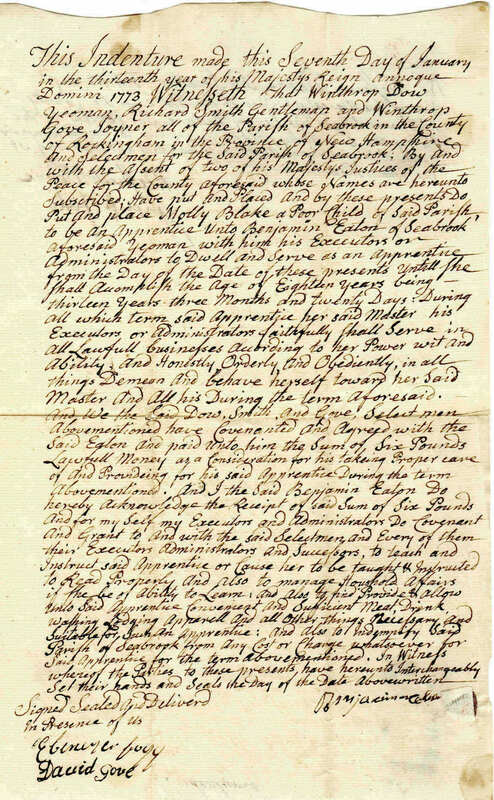 This is a wonderful, orginal document dated 1697, Malden,Massachusetts; where Lemuel and Mercy Jenkins have sold Samuel Green, Jr a plot of land known as the sheep's pasture.....signed at bottom by Lemuel Jenkins, Mercy Jenkins, John Link and Thomas Oakes. Signed on back by John Leverett the Younger as Justice of the Peace. Document is 8x12, folds, else in overall very good condition. Lemuel Jenkins (b. 1643, d. 20 Dec 1713)Lemuel Jenkins (son of Joel Jenkins and Sarah Gilbert) was born 1643 in Braintree, Norfolk, MA, USA, and died 20 Dec 1713 in Malden, Middlesex, MA, USA. He married (1) Elizabeth Oakes on 12 Jul 1670 in Malden, Middlesex, MA, USA. He married (2) Mercy Tufts on 11 Jun 1694 in Malden, Middlesex, MA, USA, daughter of Peter Tufts and Mary Pierce. Thomas Oakes, son of Thomas (1) Oakes and his wife Elizabeth, was born after his father had died, and in the will he was given a double portion of the paternal estate. He was known as Thomas Oakes, of Maiden, in which town the scene of his life was laid. He married May 22, 1689, Sarah Tufts, daughter of Peter Tufts, who was the ancestor of one of the most important branches of the Tufts family in America. In 1663 he became proprietor of two hundred acres of land on the Mystic side in Maiden, and also the owner of the Nowell grant. John Leverett (August 25, 1662 – May 3, 1724) was an early American lawyer, politician, educator, and President of Harvard College. 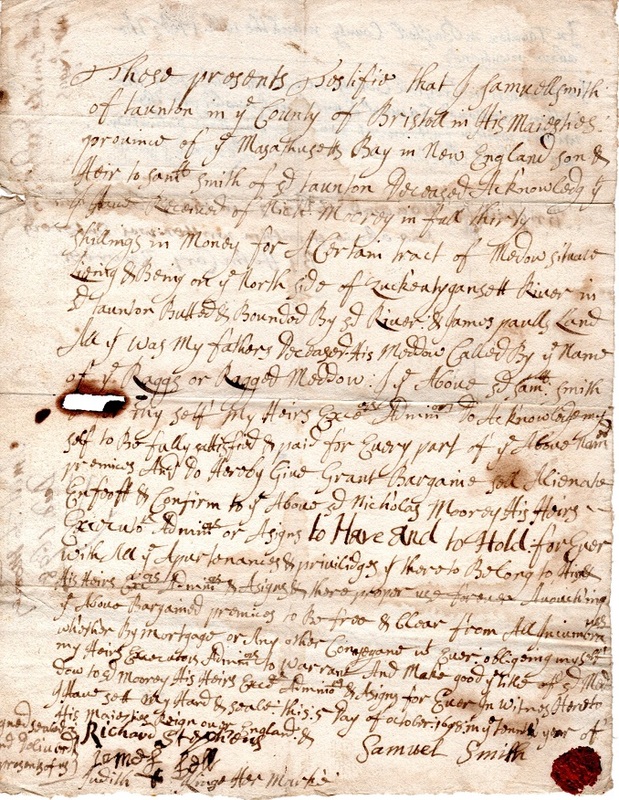 This is a wonderful, original document dated 1712, Salem, Massachusetts, where William Pickering of the sloop Content, has agreed to a Charter with partners Francis Willoughby, Captain William Bowditch, John Pickering and Samuel Barton. The Charter to go from Salem to Virginia, then to Curacoa, then back to Salem with the partners getting shares of the profits. Signed on back by Francis Willoughby, Captain William Bowditch, John Pickering Samuel Barton﻿,Benjamin Pickman and John Pratt. Document is 8x13, ink slightly lightened, else in overall very good condition. Samuel Barton was the eldest son of Matthew Barton and his wife, Martha. He was born about 1664, probably in Salem. He grew up in Salem, and married Hannah Bridges, also of Salem, about 1690. Hannah was the daughter of Edmund Bridges and Sarah Towne. In 1692, Hannah, her mother Sarah, along with her aunts Rebecca Nurse and Mary Esty, were accused in the Salem Witch Trials. Rebecca and Mary were hanged, but Sarah,who was also condemned, escaped from the jail in Ipswich. 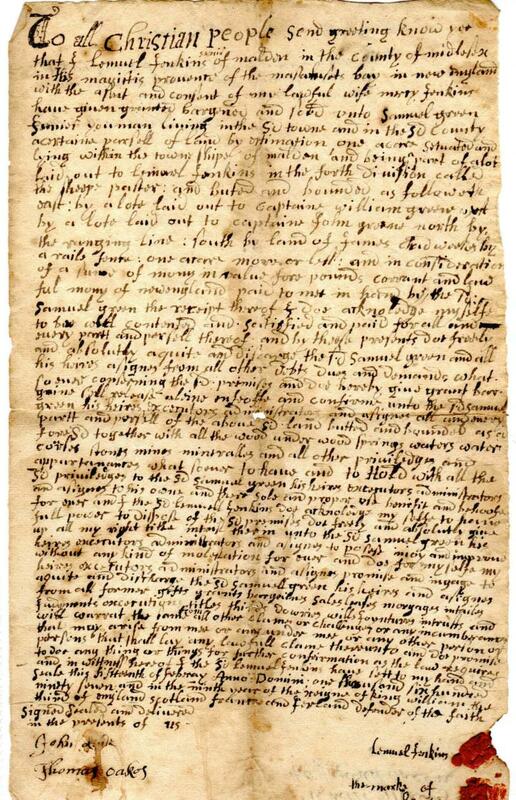 In the spring of 1693, members of the Towne, Bridges, Barton, Cloyes and Elliott families moved away from Salem, no doubt because of the witch hunts, and settled in the new community of Framingham, where Samuel and Hannah's second child was born in 1694. In 1716, Samuel sold his land in Framingham and bought one-thirtieth of the settlement at Oxford, including one-fourth of the sawmill. In 1720, Samuel and Hannah were covenant members of the first church of Oxford. Beginning in 1726, Samuel began giving his lands to his sons, and in the summer of 1732, wrote his will. It was proved on September 23, 1732, after Samuel's death on September 12th. Hannah lived for another four yearsand died on March 13, 1736-7. Both Samuel and Hannah are buried atOxford, in the cemetery west of the common. William Pickering (1670-1723), was a successful sea captain and later a merchant in Salem﻿. John Pickering (1658-1722), like his father, was drawn to public service. In addition to farming, he was elected selectman in Salem three times and was a representative to the Massachusetts General Court from 1714 to 1716﻿. 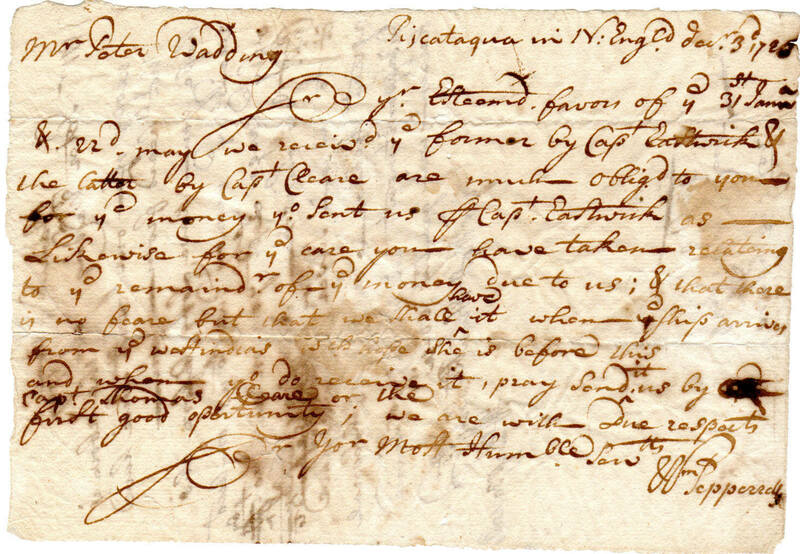 This is a wonderful, original document dated 1720, Newport, Rhode Island, where William Wanton, merchant, and his wife Ruth have purchased 10 acres of land from the trustees of the estate of William Coddington. It seems bills of credit were issued by the General Assembly to back this purchase, with the amount of 8 pounds being paid as interest. Signed at bottom by William and Ruth Wanton, John Rogers, James Martin and John Wanton as Lt. Governor. Back is signed by William Coddington and several times by John Wanton as having received the eight pound payment. Document is 12x15, folds, minor paper loss, else in overall very good condition. William Wanton (15 September 1670 – December 1733) was a Quaker governor of the Colony of Rhode Island and Providence Plantations, serving a short term prior to his death.He spent most of his adult life in the civil and military service of the colony and commanded a sloop for chasing privateers. In all but two years from 1705 to 1732, Wanton was either a deputy or an assistant, and for many of those years he was the Speaker of the House of Deputies. From 1705 to 1709 he was the Major for the island of Aquidneck, and from 1719 to 1720 he was Colonel of the island's militia regiment. Wanton commanded a sloop that he used to chase privateers, and in 1709 the General Assembly voted to buy his new sloop Diamond for 400 pounds, and also buy another sloop of which he was partial owner. In 1726 he was one of four commissioners from the Rhode Island colony selected to meet with commissioners from Connecticut to settle the boundary line between the two colonies. John Wanton (24 December 1672 - 5 July 1740) was a governor of the Colony of Rhode Island and Providence Plantations, serving for six consecutive terms from 1734 to 1740. He first entered public service in 1706 as a deputy from Newport serving for several years in that capacity, and also as the Speaker of the House of Deputies. He was called Colonel John Wanton in 1706 when he went after French privateers with John Dublin, who was wounded in the action. Between 1721 and 1734 Wanton was the Deputy Governor for the colony, and following the death of his brother, William Wanton, he became governor in 1734, serving continuously until his own death in 1740. He was buried in the Coddington Cemetery in Newport. a proprietor in common lands. James Martin of Newport, was Secretary of the Colony from 1733-1746. This is a wonderful original Colonial Lottery,The First Lottery In America 1744 Massachusetts Ticket. 1744. Massachusetts Government Lottery. Very Choice near Fine. Printed in deep black on fine quality, period laid paper that remains fresh and crisp in appearance. Full margins and outer border make this a particularly impressive and superb looking example of this most historic and earliest, the very first of all lotteries to be held in America. Rare. This is a wonderful. 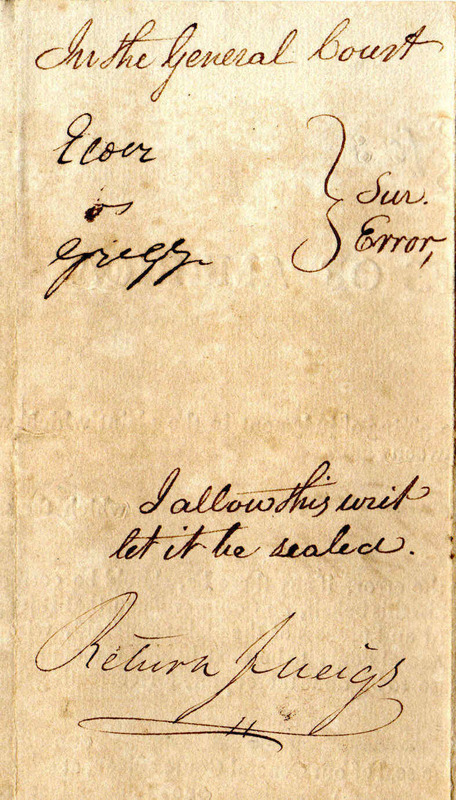 original folio, dated 1802, Northwest Territory, an appeal to be decided on, a writ between Samuel Elder and Thomas Gregg. It seems the original finding was in favor of Samuel Elder for $100, but mistakes were made and the amount should be adjusted to $70. Quite alot of argument being made for only $30. 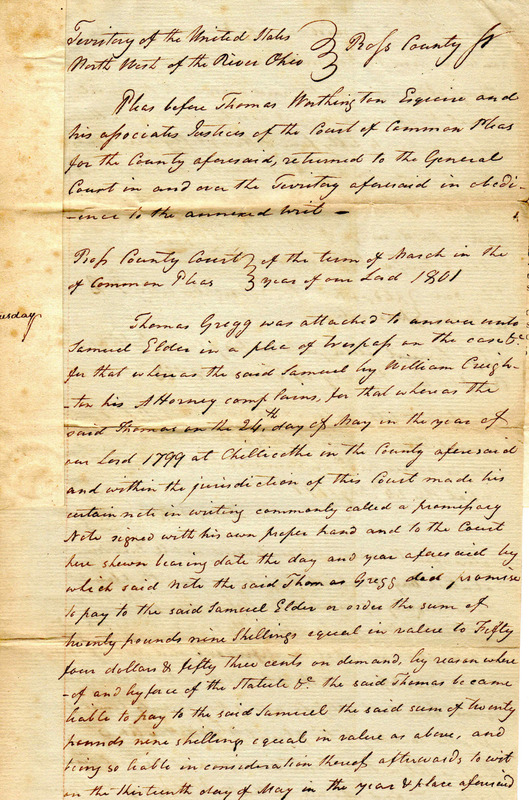 First doument dated 1802, on Northwest Territory letterhead is signed by Daniel Symmes as clerk of the court showing the need to open the case.Signed on front by Symmes and on back by Return Meigs allowing the case to be heard.Document is 8x10, toned, else in overall good condition. 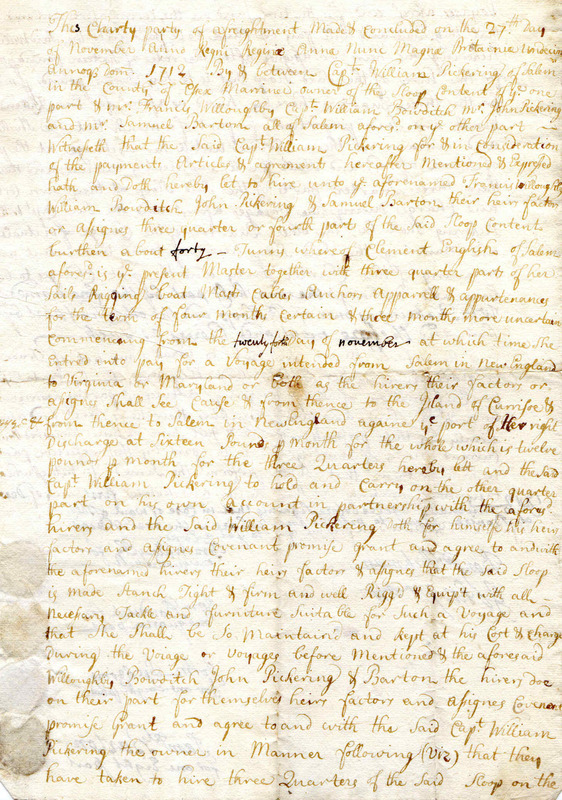 Second doument is three pages, tipped to the right edge of the first document listed above. The complete argument as laid out before the courts, signed at bottom of third page by Edward Tiffin as Ptothnotary.Document is 8x12, three pages, tipped to first, overall very good condition. 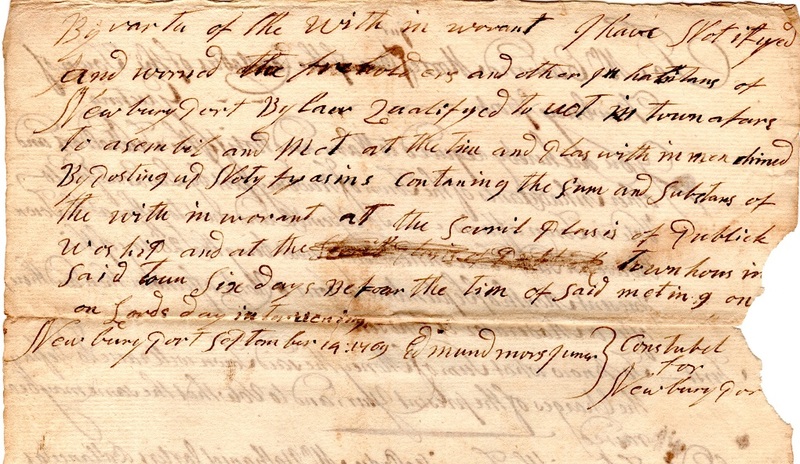 This is a wonderful, original document dated 1773, Seabrook, New Hampshire, where 5 year old Molly Blake, a poor child of the parish, is bound unto Benjamin Eaton as an apprentice until such time she reaches the age of 21. 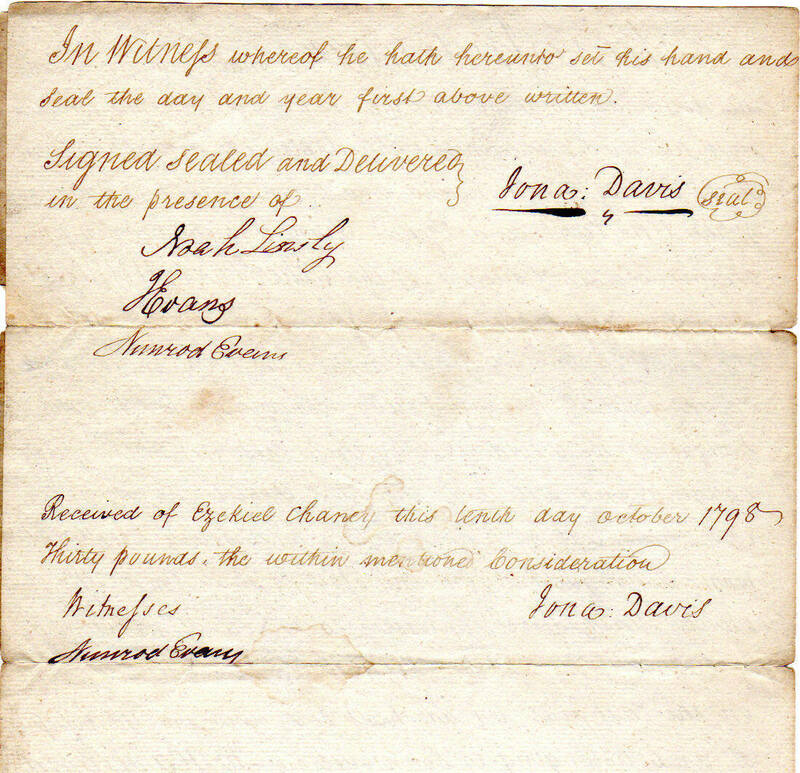 Signed on bottom by Benjamin Eaton, Ebenezer Fogg and David Gove. Signed on back by Meshech Weare and Jonathan Fifield. Document is 8x12, folds, in overall very good condition. 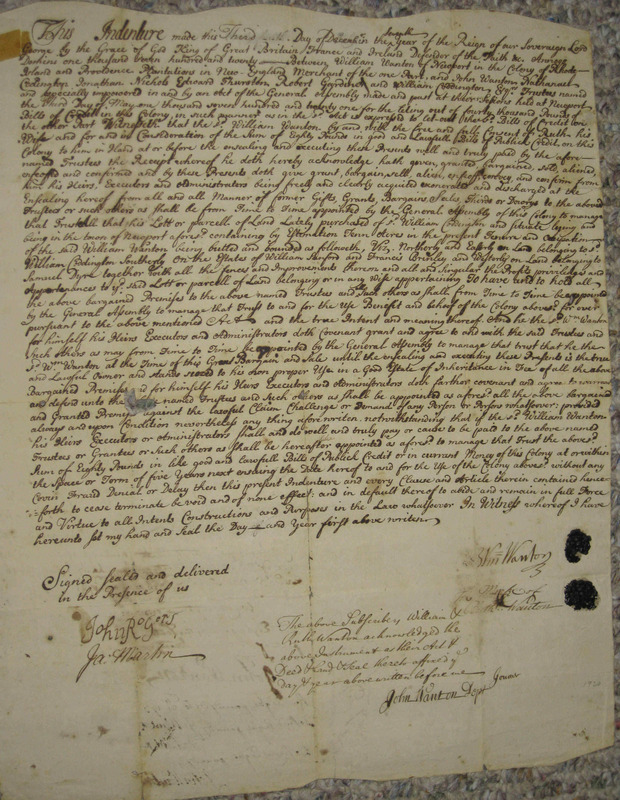 This is a wonderful, original document, dated 1698, where Samuel Smith has sold to Nicholas Moorey, a plot of land along the Zuckeantygansett river...signed at bottom by Samuel Smith, James Ball and Judith Ball. Signed on back by Thomas Leonard and John Cary. Document is 6x8, minor paper loss, else in overall good condition. Samuel Smith, Jr., born October 15, 1666 in Taunton, Bristol Co., Massachusetts; died 1718 in Taunton, Bristol Co., Massachusetts; married (1) Esther Caswell; married (2) Rebecca Hoar February 20, 1689/90 in Taunton, Bristol Co., Massachusetts. Thomas Leonard, son of James, was born in Wales and came to New England with his father, who became engaged in Bristol county in the manufacture of iron. He was a physician and a military officer. He was appointed in 1685 to hold county courts in Bristol county, and in 1692 was appointed a judge of the Inferior Court of Common Pleas for that county. He remained on the bench until his death in 1713. 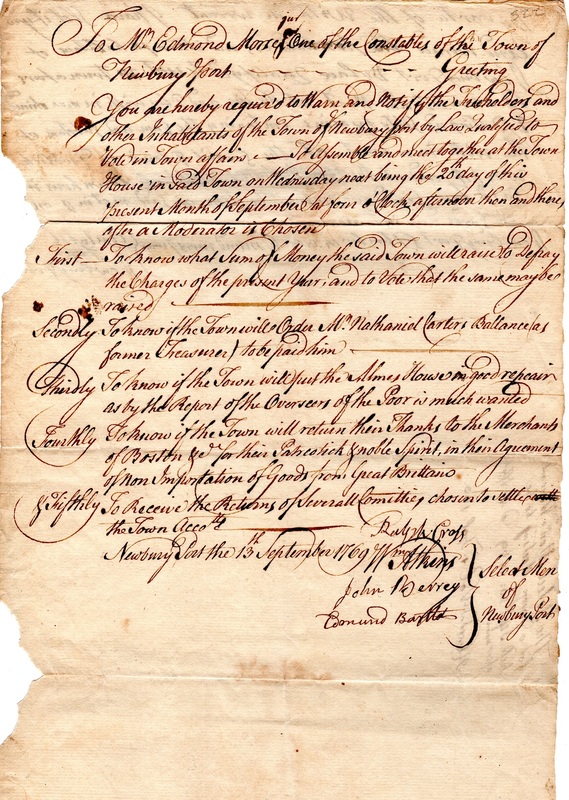 This is a wonderful original document, dated 1768, where William Pitkin has signed to pay the selectment of Bolton, Connecticut expenses for taking care of a sick Indian squaw,,,signed on front by Pitkin . Document is 4x8, edge wrinkling, else in overall very good condition. 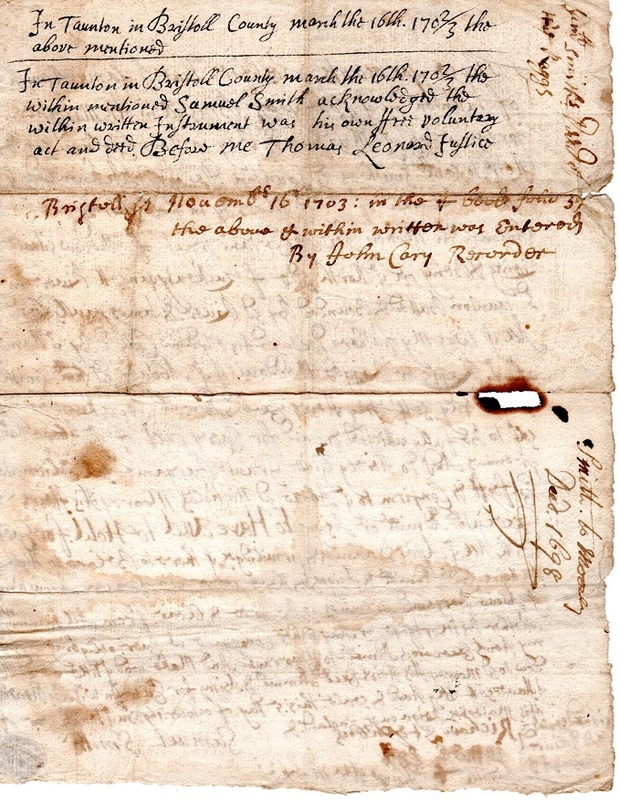 This is a wonderful, original document, dated 1702, Taunton, Massachusetts, where Benjamin Jones of Taunton has a claim against Nathaniel Pardue and wants him arrested and in jail until such time he can pay the debt...signed at bottom by John Cary. 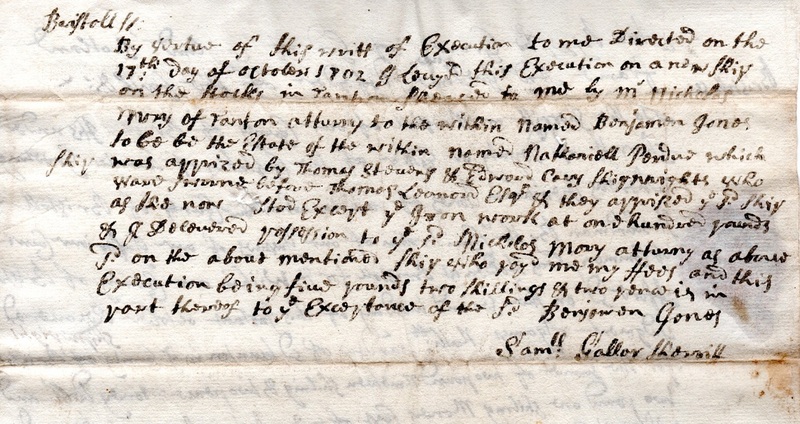 On back, Samuel Gallop has written and signed a note that he took the warrant to th shop docks of Taunton and that Thomas Stevens and and Edward Cary, shipwrights, have put forward ship iron worth 100 pounds in order to allow Nathaniel Pardue time to pay his debt. Document is 8x13, signed on front by John Cary and on back by Samuel Gallop. Overall in excellent condition. 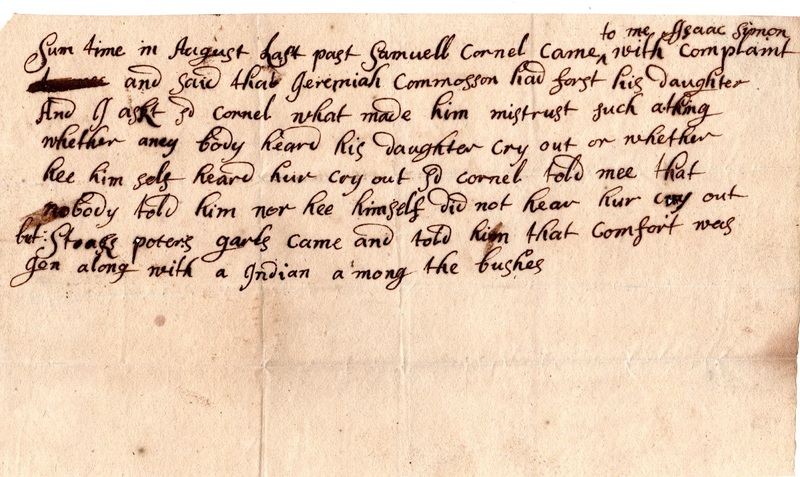 John Cary, son of John, b. Nov. 4, 1645; m. Abigail, dau. 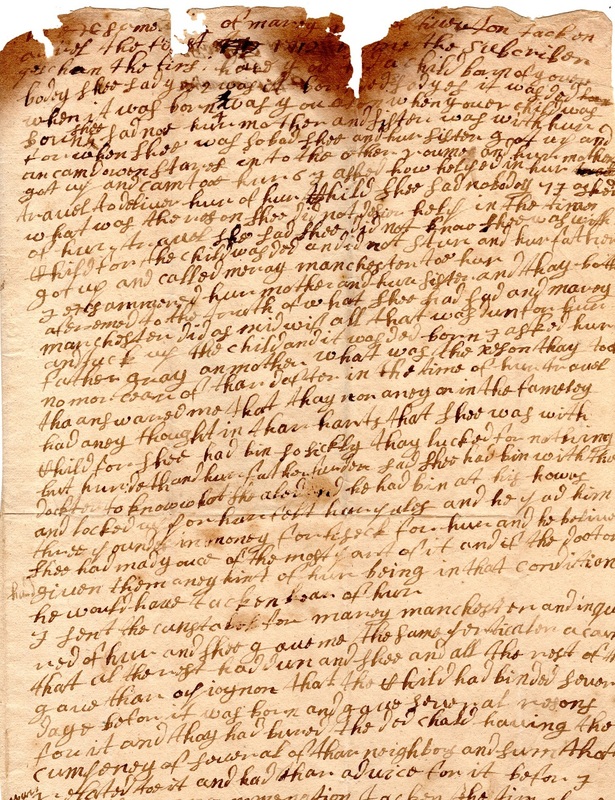 of Samuel Allen and his second wife, Margaret (French) (Lamb), at Bridgewater, Dec. 7, 1670. In 1680 he removed to Bristol, where he resided till his death in 1721. 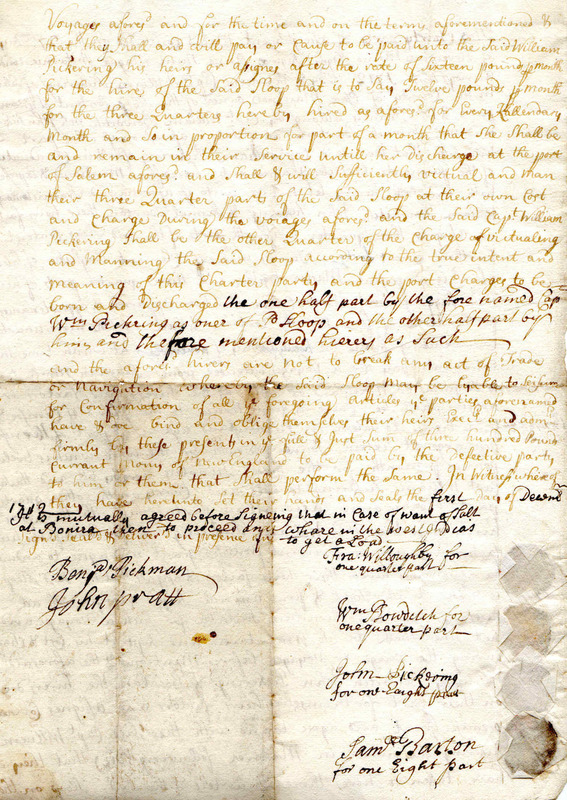 The deed to his land in Bristol was granted Sept. 14, 1680, and confirmed by the General Court, Sept. 29, 1680. The first meeting of the people and the naming of the town was Sept. 1, 1681, and John Cary and his brother David were present. He became a prominent man in the town, and was elected a Deacon of the church at its organization, and held the office till his death. He was one of the first "raters" of the town, and appointed Nov. 10, 1681; in 1693 was recording officer of the County, and Clerk of the peace; in 1694 was Representative to the General Court. His wife was also of good family; her father, Samuel Allen, came from Bridgewater, Eng., to Braintree in 1630; in 1635 he took the oath of allegiance, and was Town Clerk, Selectman, Surveyor of highways, Constable, and served as Deputy three times. 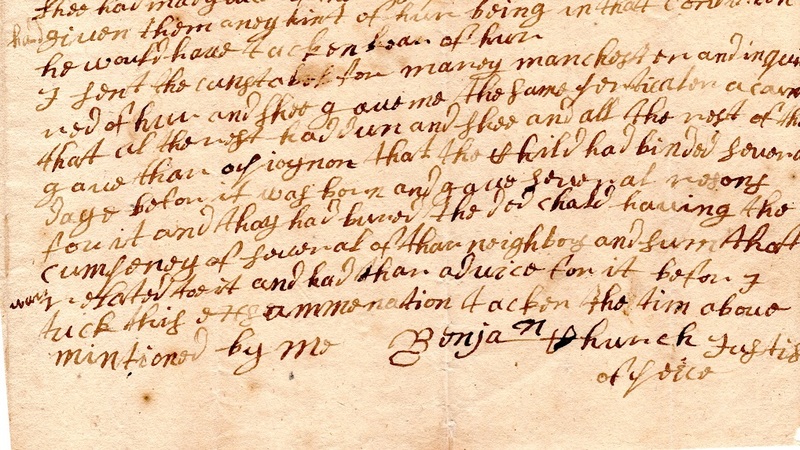 This is a wonderful, original, document dated 1715, written and signed by Benjamin Church, regarding Mary Manchester, an unwed woman who was pregnant, but supposedly lost the baby and once married she was no longer pregnant....the neighbors seem to disagree with her story and find her to have been a single woman with child.....signed Benjamin Church. 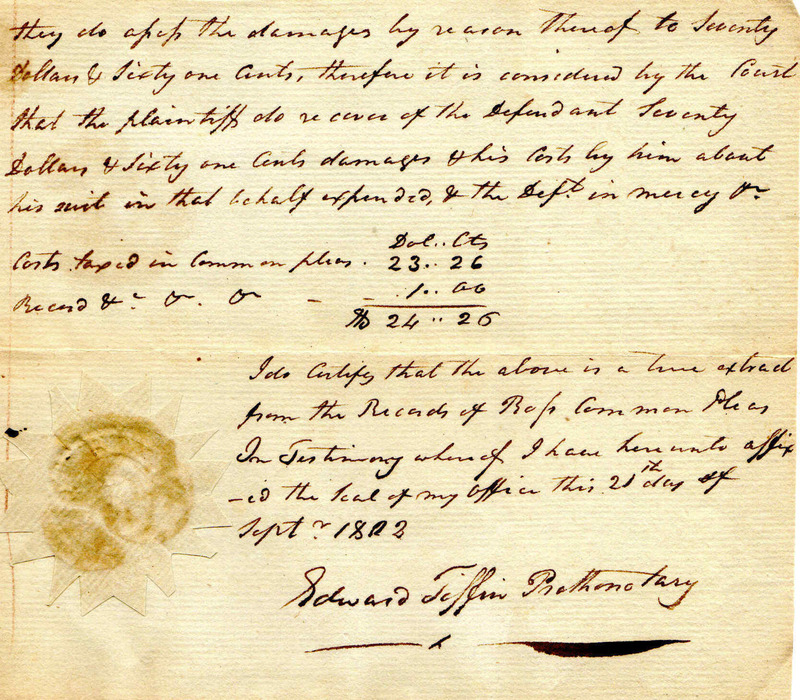 Document is 8x14, paper loss at top, else a very scarce document written and signed by Benjamin Church. 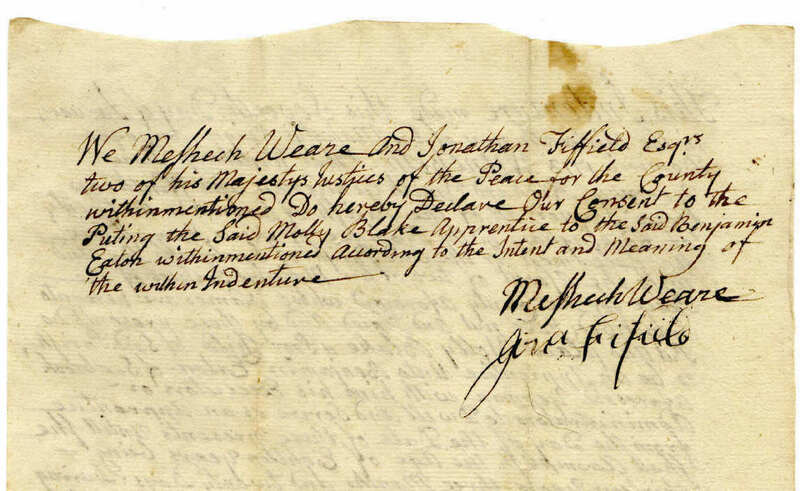 This is a wonderful, original document, dated 1769, Newburyport, Mass;, where the selectmen have signed a memorandum for several items...Article #4 to give thanks to the merchants of Boston for supporting non-importation of goods against Great Britain. Signed on front by Ralph Cross, William Atkins, John Berry and Edmund Bartlett. Signed on back by Edmund Morse Jr. swearing that he posted the notice at several places of worship and the publick town house. Document is 8x12, faults to left margin, not affecting text, overall good condition. In reaction to the Stamp Act (1765) and the Townshend Acts (1767), colonial nonimportation associations were organized by Sons of Liberty and Whig merchants to boycott English goods. ... When theacts were subsequently repealed, the boycotts collapsed. Interesting American Colonial document...5x8, overall very good condition.